Check the crab meat for any tiny fragments of shell, toss into a metal bowl and lightly season with salt and pepper, add as much mayonnaise as you like and a few chopped chives, plus a dash of lemon juice and mix well, keep chilled until needed. Put the brown crab meat into a food processor and puree, add the cream cheese, Tabasco and a little squeeze of lemon juice, mix well in the processor, but try not to make it too smooth. 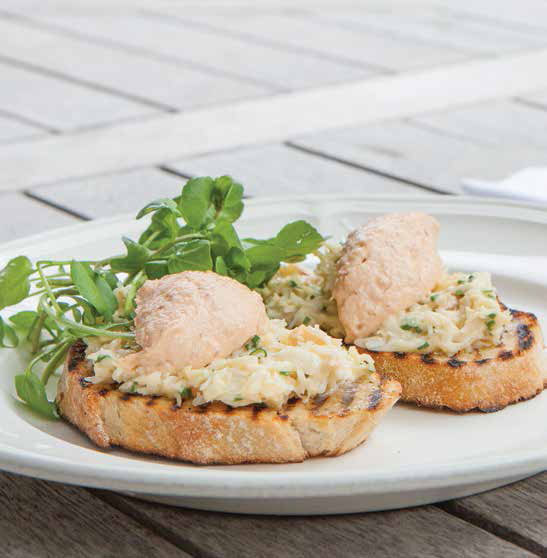 Toast the bread on both sides, spread with the butter, spread the white crab mix on top of each slice, add a tablespoon of the pate on top and sprinkle with the watercress leaves.